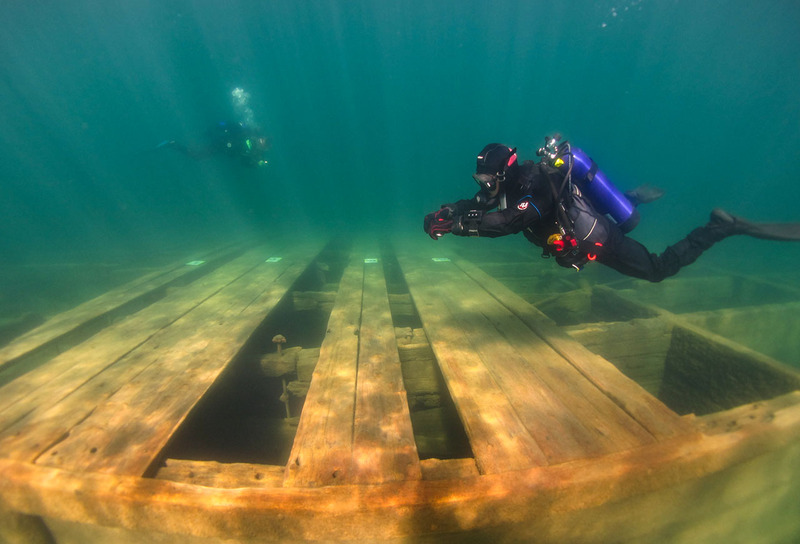 Starting October 1, 2018, the public is officially able to experience California’s first maritime heritage underwater trail devoted to showcasing Lake Tahoe’s historic recreational watercraft and barges, that now rest below the surface of Emerald Bay. Scuba and snorkel diving visitors will be able to explore an underwater “trail” of historic features at several sites along the shoreline of Emerald Bay State Park, Lake Tahoe. Currently, divers have access to the Historic Barge Dive Site established by California State Parks in 1998. The department has never publicly released the location and information about three additional sites highlighted in this underwater trail until now. Underwater interpretative panels have been placed at four dive sites in Emerald Bay. Waterproof interpretive cards created for divers will be available at the park’s visitor centers, local dive shops, online here and on the Sierra State Parks Foundation’s website. These panels and interpretive cards were made possible by the generous support of the Sierra State Parks Foundation. the quintessential Tahoe experience and one that has drawn people to the bay specifically for recreation since the 1860s. The Emerald Bay Maritime Heritage (underwater) Trail celebrates the history of Emerald Bay and Lake Tahoe’s culture of recreation by way of shipwrecks. The bay is the final resting place of several recreational boats, launches and barges used on the lake during the early 20th century. This was the heyday of the Emerald Bay Resort (1920s and 1930s) and the construction of the Scandinavian “castle,” Vikingsholm (1929). Figure 2. Wooden fishing boat with live bait well situated between the two thwart seats. Photograph by Sheli O. Smith, Ph.D.,PAST Foundation. These boats were likely purposely scuttled (sunk) when they outlived their usefulness, but now serve as reminders of the golden age of recreation in Tahoe. This collection is the largest, most diverse group of sunken small watercraft of its kind, in their original location, known to exist in the nation. Figure 3. Steamer (left) ferrying Model A on barge (right). Photo courtesy of University of Nevada Special Collections. The Barge Dive Site, located off the southeastern shore of the bay, was initially established in 1998. The site consists of two barges, built of massive Ponderosa pine timbers, sitting at a depth between 10 to 40 feet deep. The barges were owned and operated by the lumber companies, who used them to haul cordwood part of the year and then employed them as car ferries during the summer months. Since the barges had no means of propulsion, they were either towed or pushed by steamers. The southernmost barge, lying parallel to shore, represents the more complete of the two and measures over 100 feet long. This site is accessible to both snorkel and scuba diving park visitors. Figure 4. 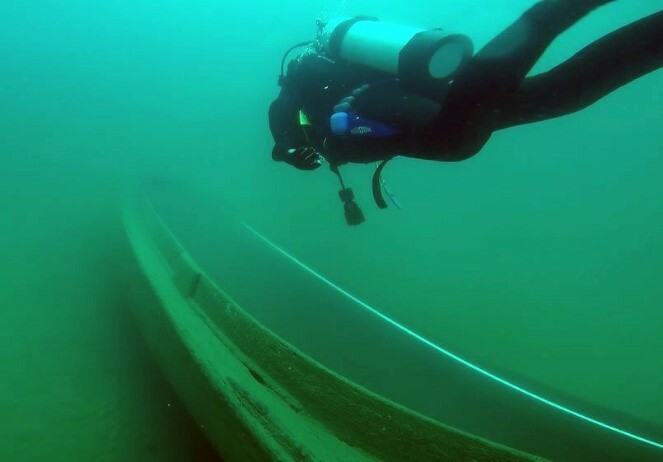 Divers photodocumenting one of the wooden barges. Photo by Mylana Haydu, Indiana State University, Center for Underwater Science. 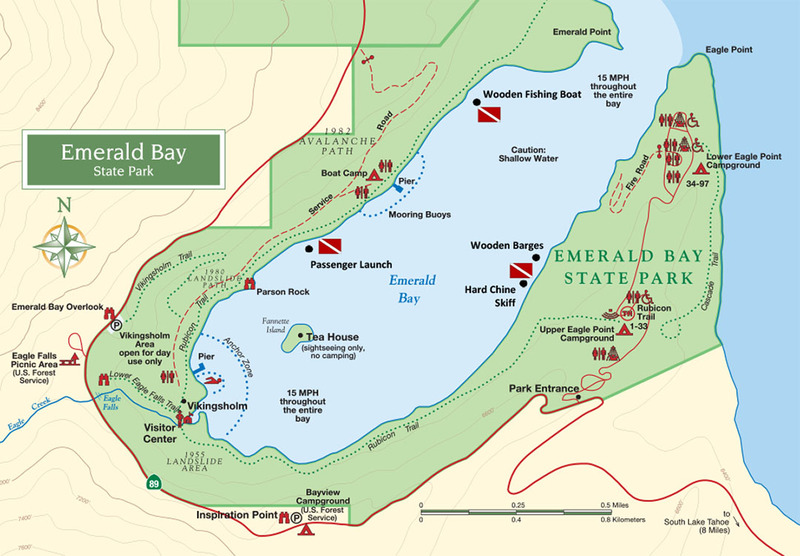 The remaining dive sites (Passenger Launch – Florence M, Wooden Fishing Boat and Hard Chine Skiff) on the trail are associated with the Emerald Bay Resort. The resort was one of the longest continuously operating resorts of this type in the area. The land was acquired by the State in the 1950s and the buildings were removed to make way for the campground. Figure 5. Emerald Bay Resort Post Card (ca. 1940). 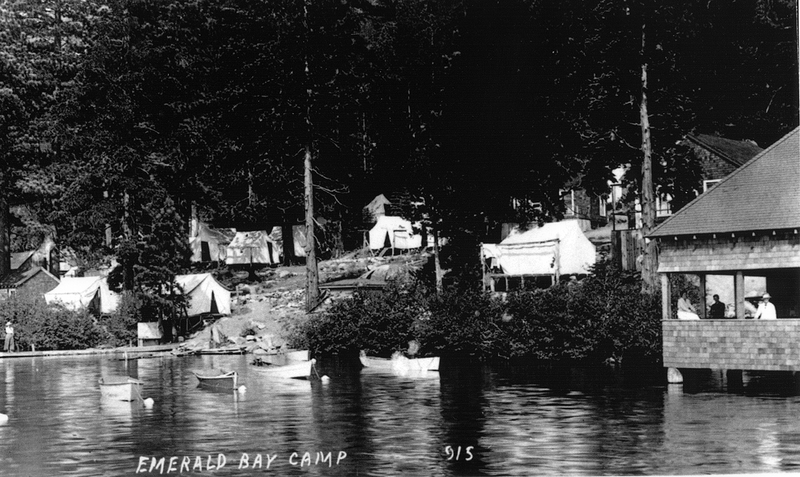 The resort once existed on what is now Boat Camp, the lake’s only boat-in campground,located on the north shore of the bay. 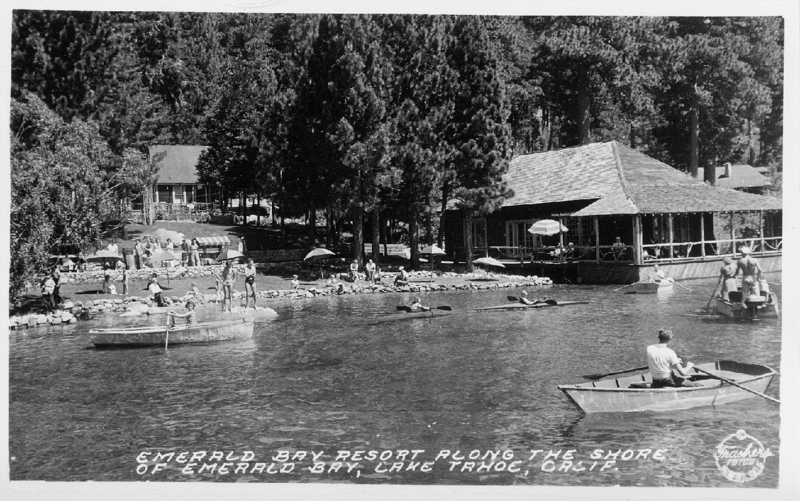 Compared with Tahoe’s luxury hotels, the Emerald Bay Resort was a simple family resort with a hotel, cottages, tent pads, dance pavilion, and all necessary infrastructure including several piers where steamers could dock to unload passengers and supplies. The resort offered several forms of recreation, but the small recreational boats were undoubtedly a popular element to the experience. Figure 6. Recording the passenger launch, Florence M.
Photograph by Ken Kramer, Parks Dive Safety Officer. Just offshore of Boat Camp is a collection of small vessels that were likely sunk at their moorings, 30 to 60 feet below the surface. 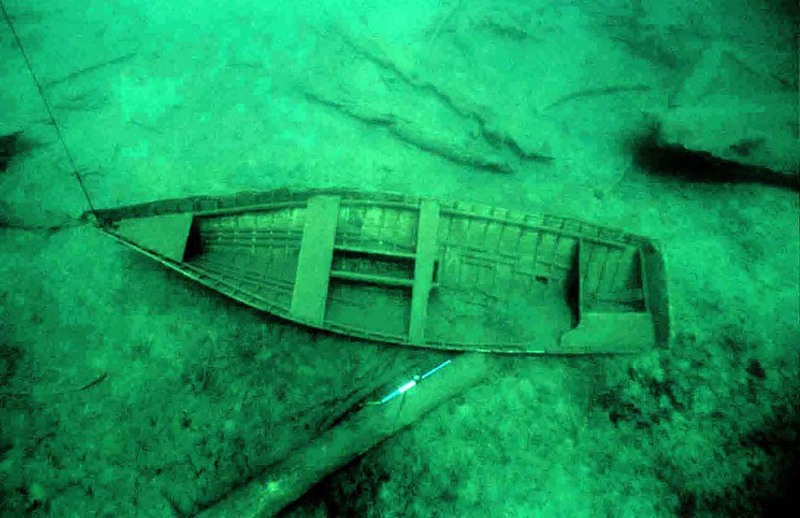 The cold Tahoe water helps to preserve these boats, some of which are over 100 years old. The collection includes a metal kayak, day sailor, and launch along with wooden fishing boats, rowboats, and motorboats. Along with the two large barges, the Emerald Bay Maritime Heritage Trail includes two fishing boats and a 27-foot long launch. The launch likely represents the oldest boat in the collection. She was built in 1915 at the Stephens Brothers boatyard in Stockton. 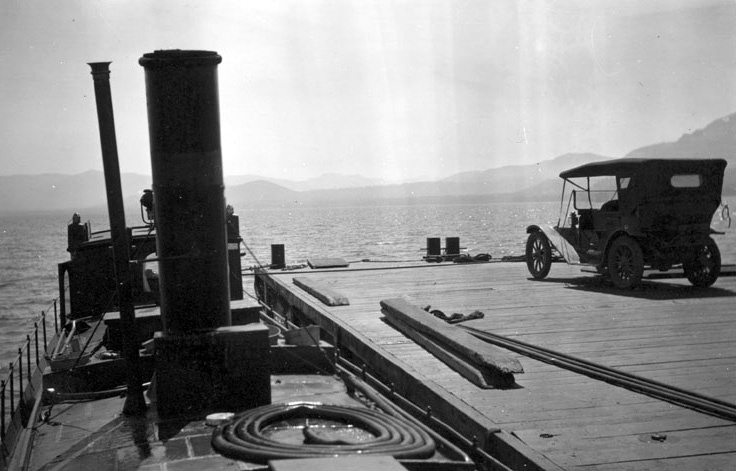 Proprietor of the Emerald Bay Resort purchased the boat, Florence M, and brought it to the lake in 1926 to provide day excursions for resort guests. To learn more about the dive sites, click here to view the new interpretive panels. The four dive sites of the Emerald Bay State Park Maritime Heritage Trail at Lake Tahoe range in depth from 10 to 60 feet. Park visitor divers are invited to explore and enjoy the trail and are reminded to use caution and adhere to safe diving practices at all times. Because of the remote location, access by boat is advised. Lake altitude is over 6,000 feet in elevation. Divers should be prepared for extreme cold water temperatures year round.